Below you can see Mika's JRC NRD-545 DSP. In addition, Mika had an NRD-535D and Jim two pieces of NRD-535D. Two receivers come in handy especially when hunting stations which have local identifications relatively rarely. RAI (Italy), all Spanish networks and NHK-2 (Japan) stations are good examples of this. 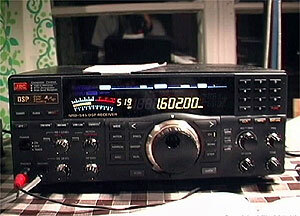 Additional equipment included amplifiers and antenna tuners. 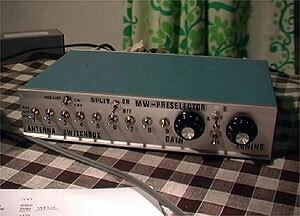 Both had a switchboard (picture below) designed by Roland Sandberg to select the antennae, and if necessary, to split a particular antenna between the two receivers. A new active splitter was used to divide some essential antennae between the listeners. This year the Lemmenjoki QTH was equipped with 14 beverage or longwire antennae. Both users can exclusively have five antennae and the remaining four are divided with a splitter, so that in effect both listeners can choose between nine wires. Each antenna is 0.8 - 1 kilometer (0.5 - 0.6 miles) in length. The recording equipment also merits a note. Mika used only minidiscs (Sony MDS-JE520 deck and a portable Sony MZ-R35), which was a revolutionary improvement to the cassette era. Jim still relied on the cassette decks, because they operate well also at his summer cottage, which has no electricity.